I watch people cold call. Often salespeople are slumped in their chairs, shoulders drooping. This body language communicates low energy. Slumpers look like they expect defeat before they even pick up the phone! 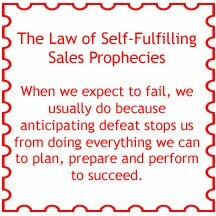 That's dangerous because this often causes the The Law of Self-Fulfilling Sales Prophecies to kick in and failure increases. And when a salesperson feels defeated, I promise you that prospects sense the mindset. It comes across in voice tone, even when there isn’t any face-to-face contact. In the May/June issue of Scientific American Mind, there was an article titled "Stop Slouching—Good posture boosts self-esteem.” Harvey Black reported on an article in the October 2009 issue of the European Journal of Social Psychology. Researchers found college students who sat up straight with their chests out felt more confident and had higher self-esteem than students who slouched. There is wisdom in this finding for salespeople. If you want to come across as confident and competent, make sure your body language reflects that. 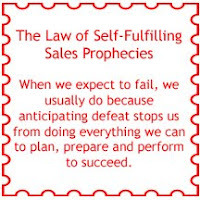 When you come across in a positive way, The Law of Self-Fulfilling Sales Prophecies works in your favor and you increase the odds of success.